If you enjoy nature and DIY projects, consider making a gourd bird house to attract small local birds. 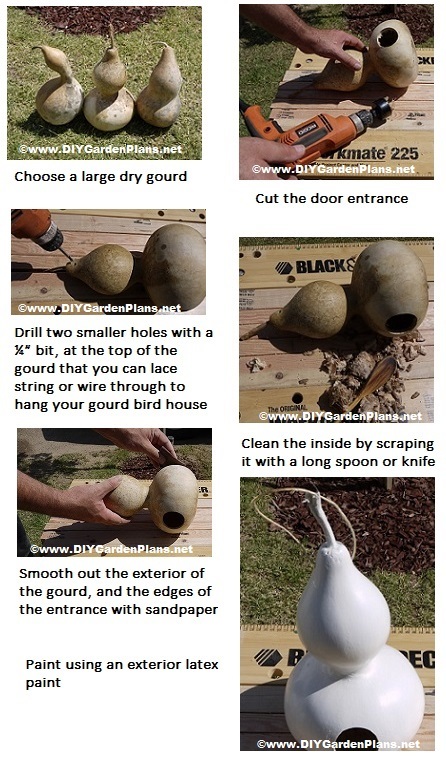 The steps below will show you how to prepare and make a gourd bird house. Dried bottle gourds are the ideal homes for birds. They have an interesting shape, and the bottom of the gourd is a perfect place for birds to nest. The ideal gourd should be large and fully dry. You know the gourd is dry when you shake it and the interior seeds rattle. Next you want to use your drill to create a hole that birds can fly in and out of. The door knob cutter is ideal but the size of the hole should be determined by the type of bird you want to attract. The hole should be at least 2 inches from the bottom of the gourd. Also drill two smaller holes with a ¼” bit, at the top of the gourd that you can lace string or wire through to hang your gourd bird house. Drill 3-4 small holes in the bottom of the gourd for drainage. Clean the inside by scraping it with a long spoon or knife. Next you need to smooth out the exterior of the gourd, and the edges of the entrance with sandpaper. When all the sanding is complete wipe down with a moist rag and let dry. The last step, and this is optional, is to paint it. You can simply paint using an exterior latex paint. However, feel free to get creative and paint beautiful patterns on the exterior of your DIY bird house.